NEW! STiKidotz DIY and Color-Your-Own Greeting Cards are a brand new STiKidotz product that let you create and send one-of-a-kind cards. Each Color-Your-Own package is exclusively designed around our STiKidotz characters. DIY Greeting Cards are completely open-ended to allow you to design your own card from scratch. All our greeting cards allow you to decorate each of your STiKidotz, then stick them in place on cover and send! Easy, creative and fun. Cards are blank Inside. CYO stands for Color Your Own! Each Color-Your-Own package is exclusively designed around our STiKidotz characters. 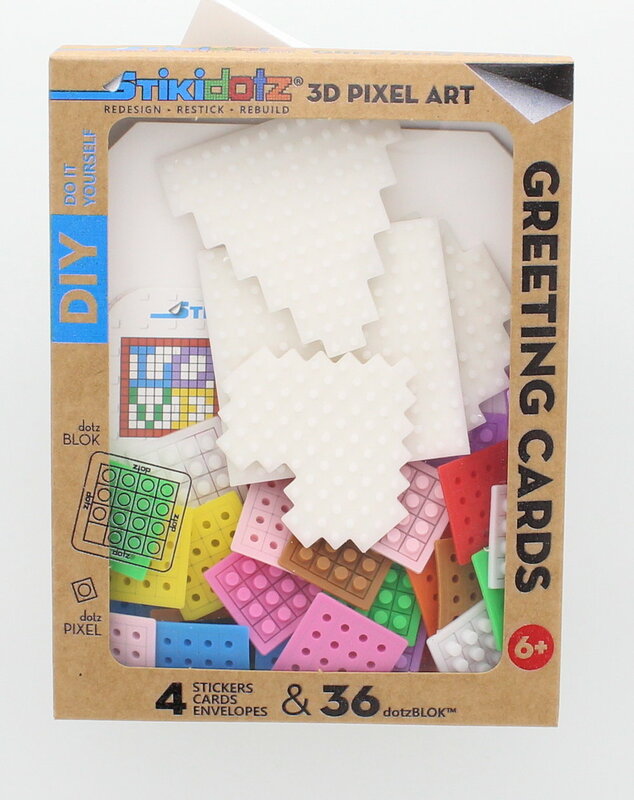 Each package includes 4 exclusively designed greeting cards for you to color, corresponding STiKidotz shapes and 36 dotzBLOKs to create your own unique pixel art sticker decoration. Color in your card and write or draw any message on the inside. Design your STiKidotz shape - use one of our designs or make your own - then remove the backing and stick in place. It's ready to put in the included envelope and sent! Package includes: 4 Color Your Own Greeting Cards (blank inside), 4 envelopes, 4 STiKidotz Shapes (Circle, Heart, Square and Triangle), Instruction card with design ideas, 36 dotzBLOKs in 12 different colors. Blank Inside. Additional Postage may apply to send cards. DIY Greeting Cards are completely open-ended to allow you to design your own card from scratch. Each DIY Greeting Card package includes 4 blank greeting cards die cut around one of our unique STiKidotz shapes to allow your creativity to flow. Decorate your STiKidotz sticker - use one of our designs or make your own - then remove the backing and stick in place. Color your card so that your sticker is part of your own unique drawing or design! Write or draw any message on the inside and it's ready to put in the included envelope and send! Package includes: 4 DIY Greeting Cards (blank inside), 4 envelopes, 4 STiKidotz Shapes (Circle, Heart, Square and Triangle), Instruction card with design ideas, 36 dotzBLOKs in 12 different colors.